my little red suitcase: etsy an overnight sale! I thought it would be nice to share what happened this morning. Yesterday after filling in my policies and listing an item on etsy I decided that before I went to bed I would open my shop. Even though I had only one listing so far. Imagine my surprise this morning when I had a look at my shop and realise it wasn't showing any items. I was a bit panicked as I thought my listing hadn't been saved! and I would have to do it again.....well it gradually dawned on me that someone had brought it!! and there it was in the sold items!..... and yes a very happy and encouraging surprise for me! So exciting! so I bounced of happily to the post office ready to tell all and sundry, and to send it off on it's journey across the Atlantic! 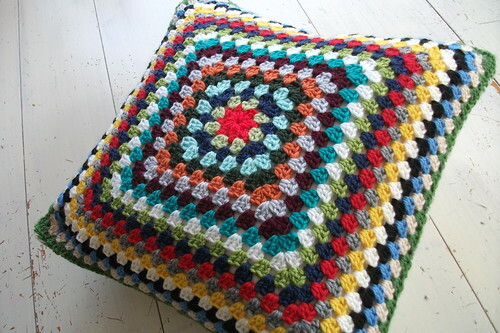 I just love the combination of colours in this cushion cover and really enjoyed making this. I loved it so much that I actually made another identical one straight after! I still need to make the cover for it and sew the pieces together. So I may re-list this again as a custom order. Setting up etsy was fairly straight forward, with a paypal account already set up. I was slightly out on the postage, I forgot to add the weight of the packaging! but I think I've done everything I said I would. So hurray for etsy, I'm so pleased! I have enthusiastically begun another! but I really need to get down to sewing and attaching covers......it's the not quite so much fun bit, although it's very satisfying to see the finished item. 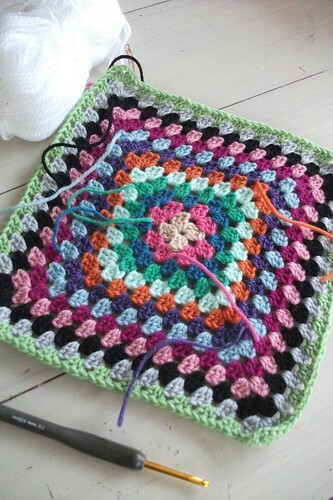 Here is a picture of my next finished cushion, ready to list on etsy. 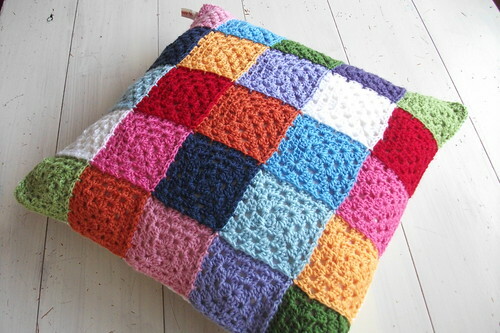 It's a very colourful holly hobby style patchwork cushion. Likely to add a bust of colour to any corner, I think it would probably be quite good fun in a caravan or children's bedroom. What do you think?.... we are going to need some colourful makes in our lives soon for sure. I have been dodging the rain all day! and now must prise the dog from her blanket again, I hope you all have a good start to the week! thanks Rachel! I think it's one of those things you never think your quite ready for, but probably are! Go for it. Congratulations on your first sale! Your new cushion is absolutely gorgeous. Congratulations - it's such a lovely feeling when others appreciate your creations. Love the handiwork, I am sure your customer will be very pleased. Congratulations Heather!!!! I'm so happy for you!!! Good for you! I knew you could do it. How encouraging to sell out so quickly! Hope all your esty listing are snapped up with similar speed. Brilliant news - I am so pleased for you and you will always remember your first sale. I am sure it will have gone to a loving home. I like your patchwork cushion and the grey one with retro circles would look wonderful at our cottage - I will be giving out some hints to my daughters when they ask me for ideas of what I might like for Christmas - I will make sure to put your shop name on my list. That is so exciting! What a great thing to wake up to :) I'm sure it makes your day so much better. *gasp* really gorgie cushions - how exciting to have your first etsy sale ... although I'm so not surprised since it is scrummy! Gorgeous cushions, hopefully you will now sell loads! Good luck!